In Bridges-Go-Round, avant-garde filmmaker Shirley Clarke shoots New York City’s structural wonders in a series of extremely saturated colors. The shots are close enough that they become less indexical (“this is a bridge”) and more elemental, images of a sensual metallic jungle, taking away any spatial understanding in service of evoking how it might feel to be lost in Gotham’s towering formations. What is familiar becomes deeply unfamiliar. It is important to note Clarke’s avant-garde roots when looking at her documentaries, notably two new Blu-Ray releases from Milestone Films: Portrait of Jason and Ornette: Made in America. On their surfaces, both resemble conventional forms of documentary filmmaking we know too well: Jason is essentially a tell-all confessional, shot over one night where a man can pour out his soul, while Ornette: Made in America celebrates of one of free jazz’s most influential artists by tracking his history and legacy. Neither, however, could be effectively summarized as that without looking at how they break down the form as well. Clarke might be considered a non-fiction artist, but the former member of the New York Underground bucks all conventional codes of her genre. An off-screen voice asks a man, “What if your name?” He responds: “My name is Jason Holliday.” The voice repeats the question, and Holliday responds with the same. 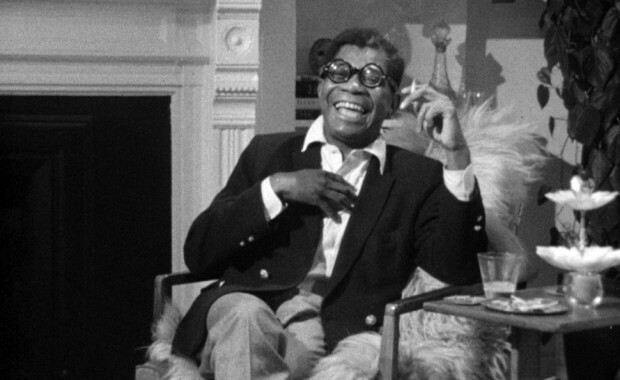 Then he is asked for a third time, and Holliday retorts, “My name is Aaron Payne.” Made in 1967, Portrait of Jason follows the titular Jason Holliday, an African American queer hustler living at the Chelsea Hotel. It’s a one-night-only performance (perhaps the first stand up documentary), as Jason slowly downs a bottle of scotch in his tell all about his hustling days working as a manservant in San Francisco, along with his rough childhood in Trenton with a gambling and abusive father. Or so it appears. Clarke’s film was just shot months after the premiere of Andy Warhol’s similarly set Chelsea Girls. Portrait of Jason then in many ways resembles the various screen tests produced at the Factory with Edie Sedgwick, which blur the lines between reality and performance. We hear less of Clarke in the film than Holliday’s partner, actor Carl Lee (the Chuck Wein to Jason’s Sedgwick), who goads stories out of him (“Tell us about…”) and then berates Jason for what he may be making up. What’s most memorable is Jason’s constant laugh following his own stories, which is less revealing than the way it further obscures our relationship to the man: is he laughing at his own cleverness, or does this laugh hide something darker? Clarke’s camera constantly goes out-of-focus on its subject, and she keeps the sound rolling for the moments when the film stock needed to be replaced, reminding us that if we wanted to see the true Jason, it’s likely when he can’t see him at all. Yet this all seems less like an act and closer to one man’s solo tragedy as the bottle empties out. “I’m happy about the whole thing,” Jason tells us, but the filming suggests a contentious battle between Clarke and her subject, a battle of mind over cinema. Ornette: Made in America (1985) was Clarke’s final feature, made after a number of video projects in the 1970s. It begins as many documentaries focusing on musicians do: it’s tribute night for Ornette Coleman, so we watch as he prepares for his big appearance at the concert hall in his hometown of Fort Worth, Texas. Although Clarke begins with a simple capturing of an event, she begins editing between a young boy holding a saxophone and the older Coleman performing. Clarke began filming Coleman back in the 1960s and never finished that project, so she uses the breadth of her footage to make something capable of jumping back and forth in time, in its cutting on elemental moments reminding me of Terrence Malick in some ways. Coleman’s music thus becomes the basis for Clarke’s own experimentation. The musician saw his style as “organized disorganization,” and it’s certainly the way Clarke seems to grasp all the certain details of Coleman’s life: his childhood in racist Texas, his controversial decision to replace his drummer in 1968 with his 11-year-old son, and an influential trip to North Africa with fellow beatnicks and the Jajouka style he brought back. In the first half, Clarke’s swift and punchy editing allows us to put together Coleman’s experience, with only an occasional text at the bottom of the screen to situate us. As the timeline becomes more conventional and we learn about his even more experimental work through talking heard interviews, Clarke’s filming attempts to do the same, resembling something closer to Scratch Video by imposing images of Coleman into video games and footage from space. I’m not sure it entirely captures how strange a listen this music is, mainly because the experimental properties of music and cinema don’t particularly match up. But the attempt is more than worthy, if only for avoiding a simple presentation of Coleman as someone who could be understood. He remains an enigmatic figure — not much of a talker, only hinting at his own process rather than really letting us in. And thus, like Jason and other documentaries by Clarke, the point is to use the camera’s best technique: the obscuring of reality. For Clarke, the only way cinema brings us closer to truth in not by stating it, but manipulating it. Portrait of Jason and Ornette: Made in America are both now available on Blu-ray.